Is the era of LLDS Energy Regulator upon us? 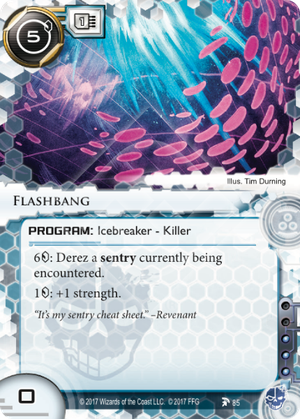 Acacia provides a potentially powerful economic consolation prize to the Runner when they have to remove virus counters during a purge, with the downside of being trashed. However, the trash is not a cost that has to be paid to gain the credits, so can be prevented (unless future FAQs address this). Enter this heretofore underused piece of LLDS software, with its reusable hardware trash prevention ability. Although it does require credits to do this, that’s exactly what Acacia gives you! So as long as at least three virus counters are lost (which I’m sure Aumakua and Datasucker can help you out with), the Runner is able to keep Acacia around even if they’re on zero credits when the Corp purges. Add into this the fact that LLDS Energy Regulator costs but a single influence pip in Anarch, and can be rescued with Retrieval Run, and you’ve got just enough synergy to potentially make this work. 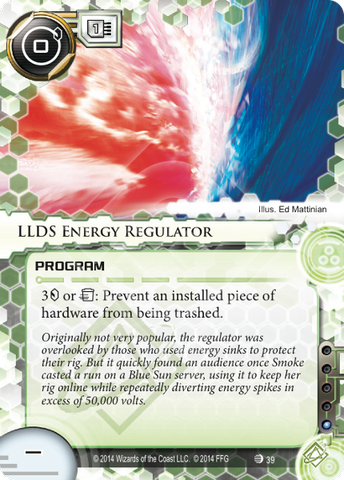 The downside, of course, is that LLDS Energy Regulator is yet another piece you have to find to try and make Acacia builds work. For this reason, I’ve been experimenting with a MaxX build to help find the necessary bits, with the combo sort of coming together in the few games I've tested. I highly doubt the LLDS Energy Regulator meta is finally upon us, but Acacia has no doubt given this oft forgotten card a boost.